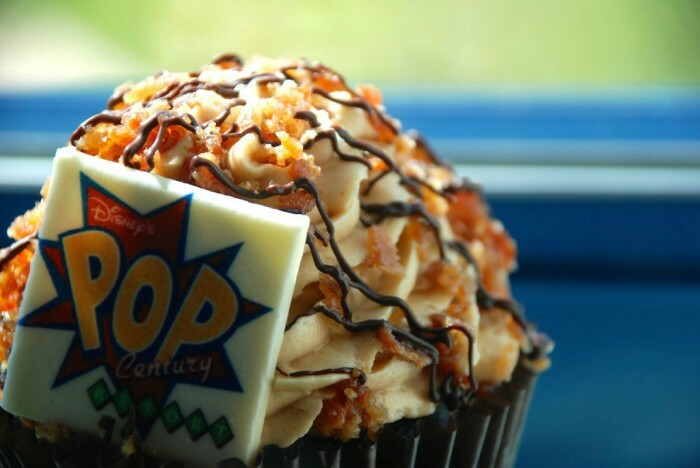 We’re starting a series on ways you can “plus” your vacation at Walt Disney World. If you’re not familiar with the term, “plussing” is Disney-talk for taking something great and wowing the guest by making it even greater. Our first article talks about options for larger hotel rooms. Walt Disney once said that Florida had something special …the blessing of size. It is called Walt Disney World, after all. But with all that space and elbow room at Walt Disney World, wouldn’t you want the same for your accommodations? Today we’re talking about where to find larger rooms at Walt Disney World. Fortunately, several Walt Disney World resorts offer options for large families or anyone looking for some extra space during their stay. I’m comparing the pros and cons of the Fort Wilderness Cabins, the Art of Animation and All-Star Music Family Suites, and 1-Bedroom DVC Villas in pursuit of the best option for your family when looking to plus your stay! The 504 sq. 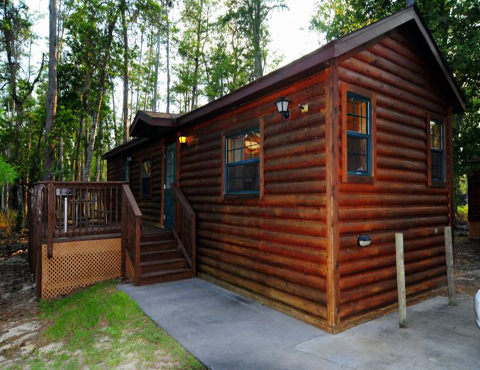 ft. cabins at Disney’s Fort Wilderness Resort and Campground sleep up to six adults and offer a bedroom, full bathroom, and a full kitchen/living space. Each cabin has a small driveway for either a personal car or golf cart, as well as a deck with a grill and picnic table. The cabins are classified as a Moderate Resort, but in actuality they are a wild card in the Disney resort classification system as no other accommodations on property are quite like them! Our own Steve Bloom wrote up a stay in the cabins this summer after the resort received a large refurbishment. The full kitchen is one of the biggest perks of a cabin stay with a full size refrigerator with filtered water/ice maker, a dishwasher, convection oven/microwave, toaster, coffeemaker, and a abundant cabinet and counter space. Cups, plates, silverware, and more for six guests is provided, plus cutting boards to can openers to a casserole dish! The cabins make excellent use of space with an impressive amount of storage, and daily housekeeping is provided just like any standard resort room at Walt Disney World. The cabins are my idea of camping offering privacy and tranquility, yet close proximity to all sorts of recreation plus the Magic Kingdom. They also offer a feel that’s less like a hotel and more like a home. The Fort Wilderness Cabins are smaller in square footage compared to other resort options. They also have only one bathroom and one sink. Sleeping 6 in a cabin (as Disney claims is the capacity) is going to feel cramped. The biggest downside (for some) is the transportation system. The resort is massive and walking isn’t always a realistic option. Many guests drive their own vehicles or rent a golf cart for $62.84. The only other alternative is the internal bus system. Boat transportation is offered from The Settlement to the Magic Kingdom, which is great in a way, but can be cancelled due to choppy waves or bad weather. In this case, the resort offers buses to the park, but it can cause confusion and delays regardless. For more info, check out Camping 101: Getting Around Fort Wilderness. Two of Disney World’s Value Resorts, the Art of Animation Resort and All-Star Music Resort, offer family suites that sleep up to six adults. The suites at both resorts offer a master bedroom with a queen size bed, two bathrooms, a kitchenette, and a double sleeper sofa. However, sleeping accommodations, theming, and square footage slightly differ between the two. At the Art of Animation Resort, three of the four themed wings have 565 sq. 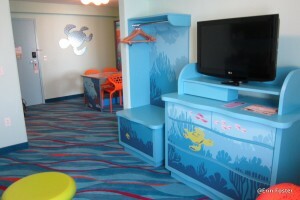 ft. family suites intended to immerse guests in the worlds of Finding Nemo, Cars, and The Lion King. To accommodate more guests, the living room table converts into a double-size bed. The All-Star Music Resort is also divided into wings and themed after musical genres. The Jazz and Calypso buildings house the 520 sq. 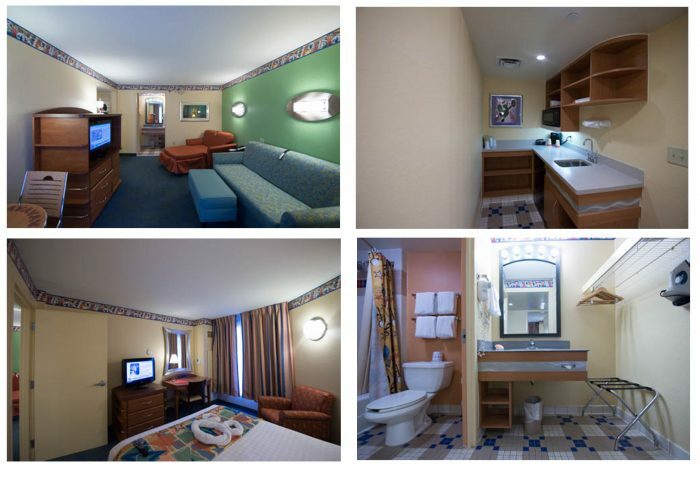 ft. suites, but the interior theming is more standard. For more sleep space, the suite has a twin-size sleeper chair and sleeper ottoman. From sitting area to door. 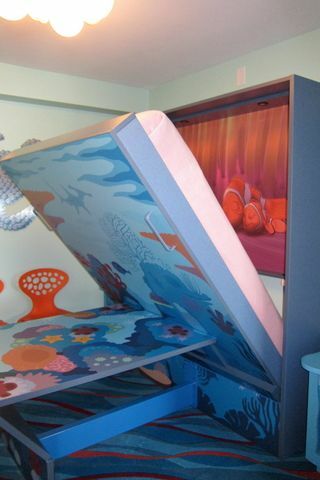 The Art of Animation family suites offer a table that converts to a bed. The Art of Animation and All-Star Music Family Suites are larger than the Fort Wilderness Resort Cabins; but the best part is that they have two bathrooms! The Art of Animation Resort is the newest and best of the Value Resorts with the largest resort pool at Walt Disney World and a fantastic food court. Also, unlike other Value and Moderate Resorts, the Art of Animation suites face interior hallways like the Deluxe Resorts. The All-Star Music Resort is the costs the least of the large resort rooms and the most affordable option. Despite the size of the suites, they only offer kitchenettes. As most rooms at Disney World Resorts already offer mini-fridges, you’re only getting a sink, microwave, and a little counter space. While you’re paying a price that is far out of the “value” category, these resorts are still firmly “values” when it comes to amenities. You do not have the dining options that come with a moderate or deluxe resort, and Disney transportation is strictly by bus – no boats, monorails, or walking to your theme park. Finally, the two resorts offer extremes in theming. The Art of Animation décor is a hit with kids, but it can be a little much or slightly plastic-y to adults. On the other hand, the All-Star Music suites are bland and basic with only a few themed touches. The Disney Vacation Club (DVC) is Disney’s own timeshare program. Each Walt Disney World Deluxe Resort has a wing of DVC Villas ranging in sizes that even non-members can enjoy if there’s availability. For the sake of comparison, I’m zeroing in on the 1-Bedroom DVC Villas as they are the closest in square footage and guest capacity to the cabins and family suites. Note: Not all 1-Bedroom DVC Villas can accommodate more than four adults but offer more square footage than the cabins or suites. While 1-Bedroom DVC Villas vary from resort to resort, guests can count on a full kitchen, living space, private balcony/patio, two bathrooms, and a master bedroom. A 1-Bedroom DVC Villa offers a full kitchen equipped with everything guests may need, just like at the Fort Wilderness Cabins, and the television in the living room has a DVD player. In addition to offering the Deluxe Resort experience, a 1-bedroom villa has two roomy bathrooms with a whirlpool tub in the master bedroom, and a stackable washer and dryer so guests can do their laundry for free! Several Disney World Deluxe Resorts offer a separate lobby for their DVC Villas, such as the Beach Club Villas and Boulder Ridge Villas at Wilderness Lodge. It’s like having two resorts in one to enjoy and explore! Lastly, if a DVC Villa is outside your price range, guests can rent points through a reliable source which secure a stay for a reasonable, even cheap, rate! It’s definitely the way to experience a Deluxe Resort on a budget. To learn more, check out Tips for Renting Disney Vacation Club Points. Daily housekeeping is not provided if guests are staying on DVC points. Instead, villa guests receive trash and towel service on the fourth day of a 7 night stay or less; but if their stay is more than 8 nights, housekeeping is providing on the fourth day with trash and towel on the eighth. Additional housekeeping, towels, soap, coffee, and etc. costs extra. Also, while renting DVC points can make a villa affordable, the process can be intimidating to some. Booking through Disney is the easiest, but guests will pay a Deluxe Resort rate. DVC Villa rates vary greatly by resort, size of accommodation, time of year, and how you book them. For one bedroom villas expect a rack rate of around 50% more than a standard room if you book through Disney rather than with an owner. 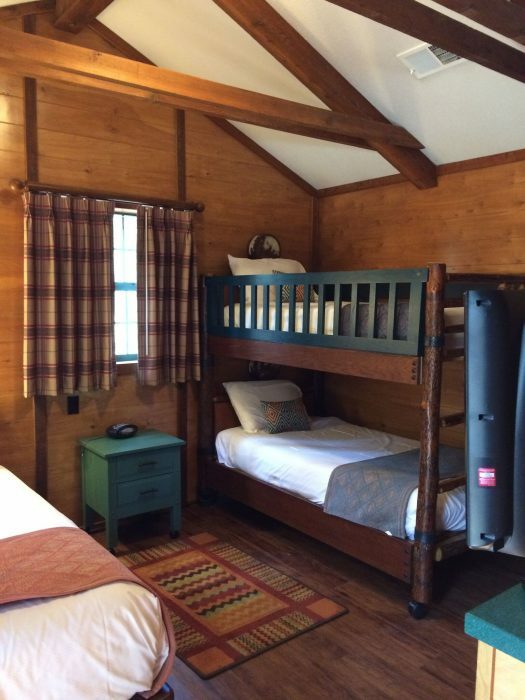 Between the Fort Wilderness Cabins, Family Suites, and DVC Villas, how do you choose? Each resort offers its own solutions for families looking to plus their accommodations, each with its pros and cons. Personally, I prefer the cabins and the villas when looking for space, but the family suites do offer affordability and plenty of room to move around in a kid-friendly setting, ideal for families with little ones. Have you ever stayed at the cabins, family suites, and a DVC Villa? Where would you prefer to stay? Share with us! We have stayed at Fort Wilderness several times an once in the cabins. My wife and I got the bedroom and the high school girls got the Murphy bed. Lots of room. It’s nice to have a place you can relax in, like a living room, and cook if you want. One bathroom didn’t seem to be too much of a problem. Transportation takes more time and you have to plan accordingly. But the whole atmosphere is more laid-back and slow-moving. It’s a great place to stay if you can deal with that. We chose a DVC rental because we could buy points 11 months before our trip; for a spring break 2017 trip, we couldn’t even get a reservation until the end of June. As it turned out, a 1 BR unit at Bay Lake Tower will cost us under $100 a night more than a suite at Art of Animation. We figured that made it a heck of a deal, since we can walk to Magic Kingdom and have easy access to the monorail. We also get a washer and dryer, which means more convenience during our stay, plus with a kitchen, we have additional options for meals other than depending on Disney food courts. We like the idea of ordering restaurant delivery, and planning to have leftovers in the refrigerator for additional meals. Recently we looked at rooms at Carribean Beach and Port Orleans Riverside (because they have the extra Murphy bed). These are probably the most affordable on-site rooms for us, a family of 5. Do you have any thoughts about these resorts or which one is better? Can a family of 5 actually fit into those rooms? Port Orleans is better: Boat to Disney Springs!! CBR probably has a nicer pool, but the Port Orleans pool seems just as nice. (Obviously a very different theme). CBR is VERY spread out, and you’ll probably want a car there. Port orleans is more friendly for disney bus users. Also, remember that children under 3 do not count against the occupancy limit. Neither choice actually FITS a family of 5 very well. My opinion (see other post) is that this is a good choice for 3 nights MAX. For longer stays, you should avail yourself of a vehicle and rent a vacation home / condo; that gets you at least 3 bedrooms 2 baths, and washer/dryer, and a kitchen with full size fridge. You can do the off site options for either similar $$ or less $$ depending on whether you have to factor in car rental and the specific off site vacation rental you choose. On a different note: Some off site hotels (like Seralago) are very creative in creating “tiny” private spaces within the hotel room like a little enclosed bunk/loft for kids. Thank you very much! Good advice! Having stayed at both, I prefer Port Orleans Riverside. It’s my go-to when staying at a Moderate Resort. The other Moderate Resorts, with the exception of Port Orleans French Quarter, are so spread out that you feel isolated and disconnected from the main resort buildings, but this is rarely the case at Riverside. A family of 5 can sleep in these rooms. It’s definitely doable, but it will be be cramped! Thank you! It’s good to here from someone who’s stayed at both! 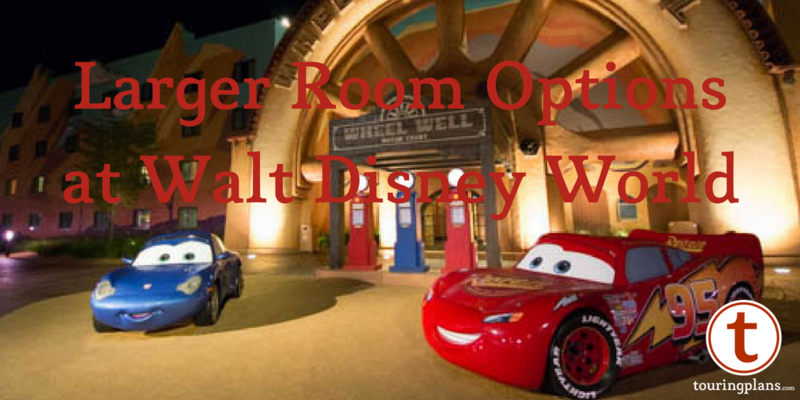 #2: Party size of 5 or 6 people and a stay of 3 nights or less (Disney will not allow most rooms for this party size). #3: Party size of 3 or less and a “luxury” mindset trading off a standard hotel room at deluxe resort for a larger sized accommodation at a less fancy resort; and also probably staying 4 nights or less. A 5 bedroom 4 bathroom pool and hot tub home for 8 nights (includes full sized laundry, private parking in the driveway, full size kitchen, almost 2000 sq ft. == must have a vehicle for the size of the whole party. Ft wilderness cabin for 4 nights; shared pool and hot tub; parking next to cabin; coin laundry in “convenience” station; about 500 sq ft.; inconvenient transportation to theme parks except possibly magic kingdom which would still take 20 minutes to allow for the boat ride == probably best to still have a vehicle. Both options are about $1600 +/- your specific dates and off site house choices or FTW cabin locations. I’ve stayed at Fort wilderness in a private camper similarly sized to a cabin. Staying at Bay Lake Tower: It’s totally WORTH it; VERY convenient WALK to Magic Kingdom; driving and bus rides to other parks are comparable to being slightly better than the drive from off property. However, it can’t really be used for a party larger than 5. My preference is always DVC. Even when traveling alone I’ll book a 1-bedroom DVC for the extra amenities and space. Most 1-bedroom DVC Villas at WDW have only one full bathroom. Those that have two full bathrooms include Animal Kingdom Villas-Kidani (not Jambo) and Bay Lake Tower. Some others have an extra sink in the whirlpool tub area but that’s all. Also, note that the DVD players have been removed from most (all?) DVC rooms. Supposedly they can be requested if needed, although I haven’t tried. We love DVC. Much more room and flexibility for just about the same cost of a single hotel room in the associated resort! However, not all DVC 1-bedrooms sleep 5. Some of them only sleep 4. To make it more confusing, with the added pull-down “day bed” in some of the new or renovated DVC studios, that means a DVC 2-bedroom (studio + 1-bedroom) might sleep 9? more? Also, note that the whirlpool tubs were removed from the Beach Club villas. Our family of five (Mom, Dad, three sons) has three trips under our belt now. First trip we stayed at Port Orleans Riverside – 8 nights. Sons were aged 10, 11, and 13. Youngest son had no issues on the Murphy bed, but it would not have worked for the older two. There’s nothing like your first trip, every moment was big. The room was on the small side for 5, but we spent nearly every moment at the theme parks or enjoying the resort. We had no issues enjoying breakfast every morning in the room and few pizza nights. Second Trip we splurged and stayed at the Polynesian – 6 nights. This followed a short stay at Universal and Cabana Bay. Sons were aged 12, 13, 15. We were there in August when the Deluxe resorts had their lowest room rates. The day bed was able to accommodate all ages comfortably. The vanity/sink area is contained in the bathroom, so only one person could get ready at a time. This challenge was worth the benefit of location. Enjoyed watching the fireworks from the beach, taking the boat to the Magic Kingdom, and the Monorail to Epcot. Third Trip was to All Star Music Family Suite over Thanksgiving. Sons aged 13, 14, and 16. Going during the holidays was on our bucket list, we knew room rates would be high and fitting all of us into one room and one bathroom was no longer an option. It was less plush than Port Orleans and the Poly, but the room was comfortable and quiet. The bus service was fantastic, never had to wait more than 10 minutes at the hotel. If the wait was long at the theme park (which happens at the after the night show), we would jump on which ever All Star bus arrived first and walk over from Sports or Movies. There were no issues with the fold out beds. Having the two bathrooms was a luxury. We’ve found that planning a Disney World trip is a balancing act. Figure out your priorities, look at all the options, and pick the combination of dates, number of days, and hotel that work for you. If you have a budget, you won’t get to satisfy every desire on one trip, but that’s okay. You can have a great time on any price point. If you have a chance to go again, change the priorities and experience something different. Great advice, Darrick! Thanks so much sharing your experiences. We’re a family of five that usually travels with other friends or families. Our first trip we did the Poly and loved it. Youngest fit easily on the day bed. Second trip we did two days at Port Orleans and the rest at Poly. We were not thrilled with fitting our family of 5 in the room at Port Orleans. It felt really tight. Third trip we knew we’d be spending time at Universal so we went in on a rental house with my sister’s family and even with both families renting a car we saved a ton of cash. Huge house, hot tub, pool, the works. Almost everyone had their own room. It was amazing. We loved the privacy, the convenience, but I have to admit we missed the magic you can only get when you stay on property. We’ll probably start planning trip four next year and I’m honestly not sure which way we’ll go. There are heavy advantages to renting a vacation home. We always stay offsite also, even though we are only a party of 2. Cost for a 3br 3bath with private splash pool, full kitchen & living room is going to be $800.61 for 9 nights for our upcoming May trip. Note, however, that prices vary widely based on which town home you pick, in which development, and during which season. While I have never personally stayed on-site, my wife stayed on-site many, many times before we met. Her opinion is that the “magic” of staying on-site is in no way worth paying more than twice the $$$ for a room 1/3 or less the size with no private pool or full kitchen. I agree. Oops, forgot that we stayed 2 nights at the Poly on our honeymoon. That room (with discount) was around $350/night then (likely much more now). We both missed the amenities of the condo, which we moved to for the remaining days of the part of the honeymoon in WDW. Honeymoon was great, but the Poly wasn’t worth the extra $$$. Would anyone please let me know where can I find those Cars from the picture for this blog post? They’re at the Cars section of Art of Animation. The pool there is themed to the Cozy Cone Motel. It’s really done well. Any other benefits you can think of? I’m really trying to find an angle for staying at the cabins but am finding it challenging. We always stay off property but I book one night in a DVC property each time we go. I love staying on property but it’s just too expensive to stay for the whole vacation as we are a family of 4 and with friends and boyfriends sometimes 6. This year there are 12 of us going so we are renting an 8 bedroom villa with 7 bedrooms and it’s own private pool. Staying on property would have cost a fortune and we wouldn’t be able to stay together.